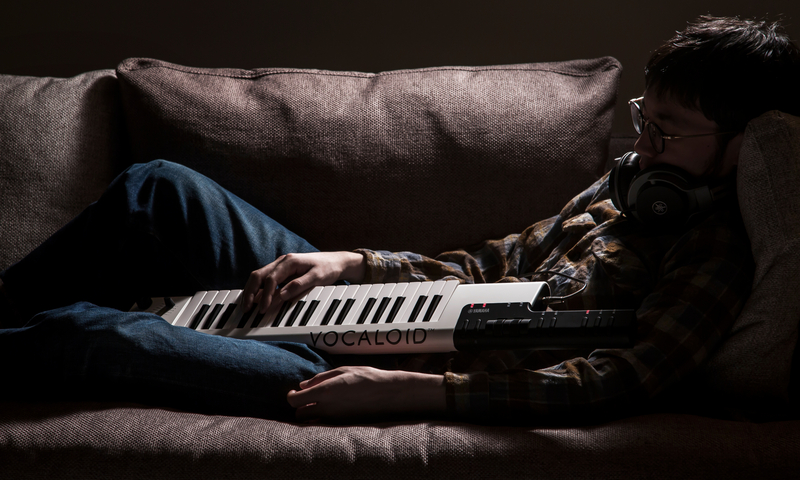 A keyboard that makes VOCALOID sing. A pure presence that emulates the character and voices assigned, without being restricted to any specific image. Free of any decorative elements, this design allows the player to color the instrument to their preference. Interface elements such as the displays and buttons needed for performance are placed in easy-to-see locations, with the logo arrayed along the keyboard focusing the attention of the audience on the player’s hands. 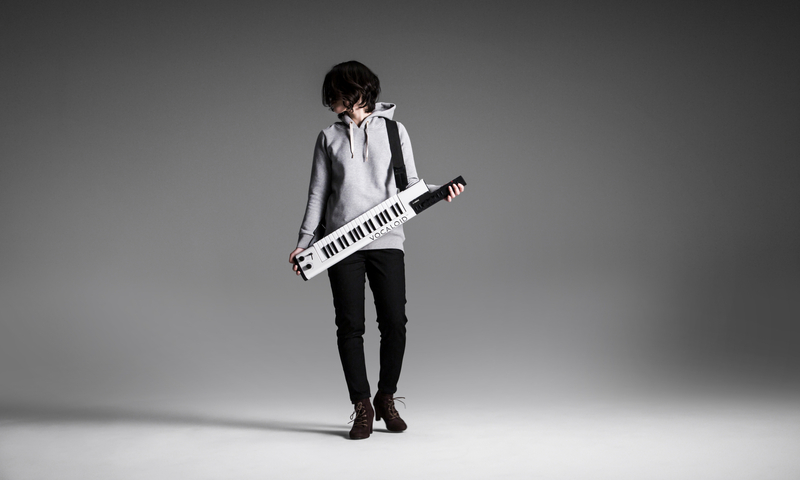 In seeking to create the ideal form for a VOCALOID keyboard—an instrument that performs vocal lines for songs—we started by crafting a design for an entirely new over-the-shoulder keyboard. Careful selection of the functions that equip the VKB-100 produced a compact, lightweight instrument that anyone can play with ease. 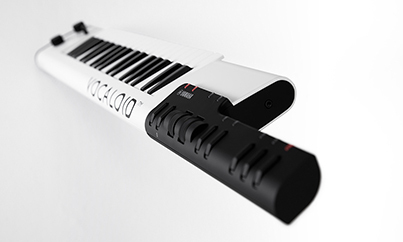 An over-the-shoulder keyboard that extends the potential for VOCALOID performance. The VKB-100 is an instrument that can make VOCALOID “sing” lyrics input in advance, following a scale played on its keyboard. Around 2010, I started out on an independent project with some friends who also work at Yamaha. Since we did not have any development budget at the time, we used discarded scrap material left lying around the prototyping rooms at work to build prototypes. We showcased our attempts at various events in Japan, including the NicoNico Choukaigi fair, while we gradually worked at improving our concept. 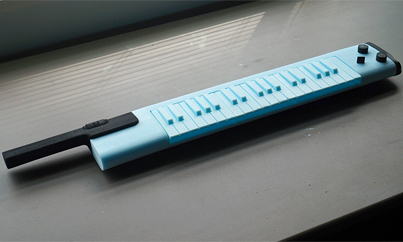 Our initial prototype was a tabletop keyboard that combined vowel keys with consonant keys to input lyrics in real time. However, from the fourth prototype onwards, we settled on developing functions focused on the concept of making VOCALOID sing. That brought us to the current form of the product, in which the right hand plays the keys while the left adds expression to the song. We thought about the kinds of scenarios in which people would use this instrument, such as when singing Karaoke. We felt that we should make it possible to play this instrument while standing and moving with it held close to the body. 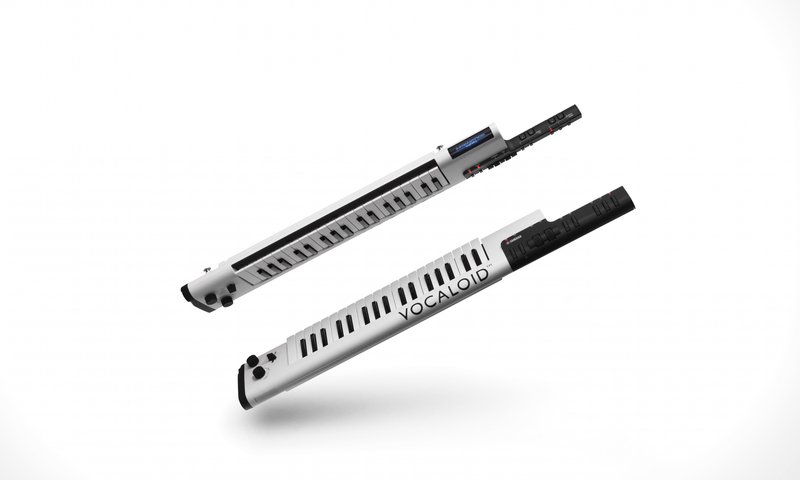 That was what led us to redesign the VKB-100 as a new form of over-the-shoulder instrument, without being restrained by the concepts embodied in previous models, efforts that produced a slim, lightweight keyboard. The grip section has purposely been set at an angle to the playing surface so that the player’s fingers are guided naturally to the home position, and the area that the fingers strike when sliding has been flattened for improved playability. 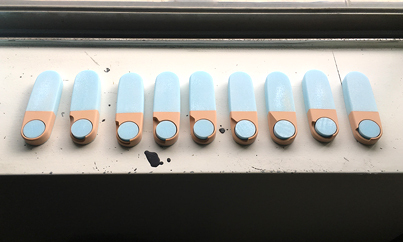 The elimination of any unnecessary decorations and functionality has produced a pure shape that acts as a canvas upon which VOCALOID characters can be projected, a perfect match for the product concept. 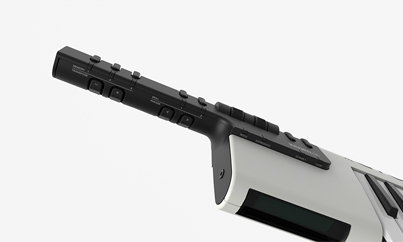 Through the keyboard—an interface that most people have tried at least once—the VBK-100 provides the experience of “playing a voice,” something that no-one has ever tried before. 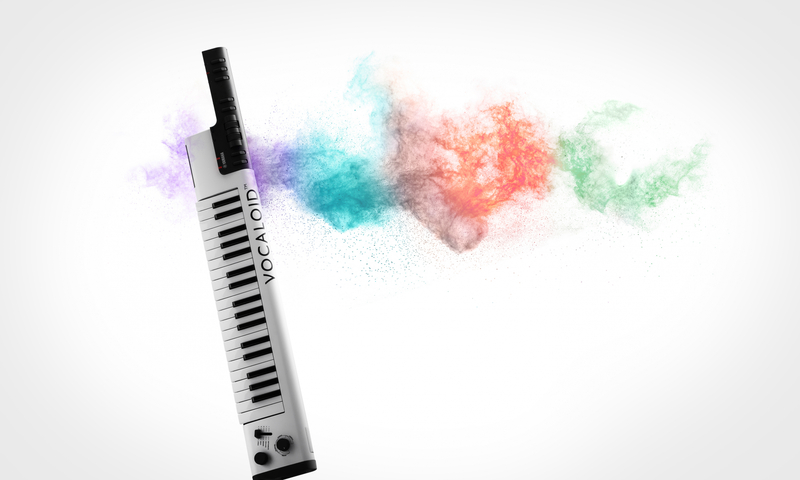 We hope that people will enjoy performing on this new instrument, which allows the player to assign a character they like to the immaculate purity of the keyboard in order to give it their own color, and to create music that utilizes the voice as a tonal element.